POLISH STONEWARE 10" BELLISSIMA ,Soup Ladle's mouth offers space to hold the liquid comfortably and the curved handle promises convenient usage of this Polish pottery. 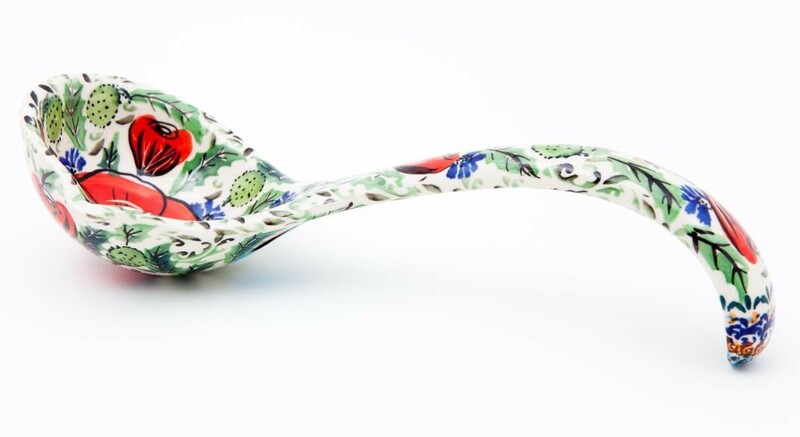 Pottery Avenue's EX UNIKAT BELLISSIMA Polish Art Soup Ladle from Boleslawiec will accentuate your experience of serving cider or soup by bringing in an artistic update to your dining experience. This Polish Stoneware employs the efforts of the skilled crafts people of Poland to create an innovative cutlery piece that is shaped and styled with impressive curves to create an interesting design. The scooped styling of the ladle's mouth offers space to hold the liquid comfortably, a spout to direct the pour and the curved handle promises convenient usage of this Polish Pottery ladle. The eye-pleasing appearance of this Polish stoneware makes it a wonderful addition to your cutlery collection as it promises an intriguing blend of form, function and timeless elegance. The EX UNIKAT pattern of this stoneware exemplifies the brilliance of Polish artisans to create an impressive design. The elaborate depiction of floral accents in red poppies is nicely complemented by green leaves to create a realistic scene of a garden, while hints of indigo blue add beauty to the flowers. The border gracing the edges features multiple layers that exhibit classic Polish designs and the rich strokes as well as the use of colors make this work of art a treasured possession. The elite Master Artisans of Boleslawiec employ brushes to paint the design with expert skill and finish with minimal hand stamp work. The design was created to allow the soft, creamy white color of the famous white firing clay to be the backdrop to contrast with the vibrant poppies painted in hues of red and blooms creating an impressive EX UNIKAT red poppies pattern from Zaklady Ceramiczne BOLESLAWIEC. Dimensions: 3.94" X 10.04" X 2.17"
A national treasure, Boleslawiec ceramics have been manufactured for centuries. Developed from natural ceramic clay that can be found near Boleslawiec at the Bobr and Kwisa rivers. According to historical sources, the first stoneware was made in medieval times and in the early 16th century, local potters formed guilds to ensure perfection. Zaklady Ceramiczne "BOLESLAWIEC" was founded by one of the original men with the first pattern dating back to 1759. “10" BELLISSIMA Soup Ladle“ is a EX UNIKAT pattern based of the 300 year old pattern "EYE OF THE PEACOCK". Designed by top designer and imported by Pottery Avenue, the premier importer of Polish Pottery & Polish Stoneware.